Orchidmania: A taste for orchids? I came across a fascinating title courtesy of Project Gutenberg. 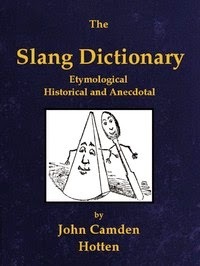 It’s The Slang Dictionary: Etymological,Historical and Andecdotal, by John Camden Hotten, a wonderful 1913 volume, full of oddities. I love this kind of stuff. Stephen Fry and his QI 'elves' would be jealous. Whenever I find anything like this, the first thing I do is look up ‘orchid’. Saloop, SALEP, or SALOP, a greasy-looking beverage, formerly sold on stalls at early morning, prepared from a powder made of the root of the Orchis mascula, or Red-handed Orchis. Coffee-stands have superseded SALOOP stalls; but, in addition to other writers, Charles Lamb, in one of his papers, has left some account of this drinkable, which he says was of all preparations the most grateful to the stomachs of young chimney-sweeps. The present generation has no knowledge of this drink, except that derived from books. The word “slops”—as applied to weak, warm drink—is very likely derived from the Cockney pronunciation of SALOOP. I hastened off to Wikipedia, and found that Orchis mascula is referred to as “long purple” by Gertrude in Shakespeare’s Hamlet. Gertrude: “Of crow-flowers, nettles, daisies, and long purples, that liberal shepherds give a grosser name.” It goes on to describe how a flour called salep or sachlav is made of the ground tubers of this or some other species of orchids. It contains a nutritious starch-like polysaccharide called glucomannan. In some magical traditions, its root is called Adam and Eve Root. It is said that witches used tubers of this orchid in love potions. Webster’s dictionary has a brief entry. Saloop, apparently, is an aromatic drink prepared from sassafras bark and other ingredients, at one time much used in London. Half right. Clarification appeared with the help of the authoritative author Stephen Hart (aka Pascal Bonenfant), whose research for 'The Unfortunate Deaths of Jonathan Wild' evolved into a marvellous source of 18th-century gems. Hart describes an intriguing book by John Timbs called Club Life of London. In it, he writes that saloop was sold at street stalls in the capital, and was a 'decoction' of sassafras; but it was originally made from Salep, the roots of Orchis mascula. Apparently, the tubers, when cleaned and peeled, were lightly toasted in an oven. 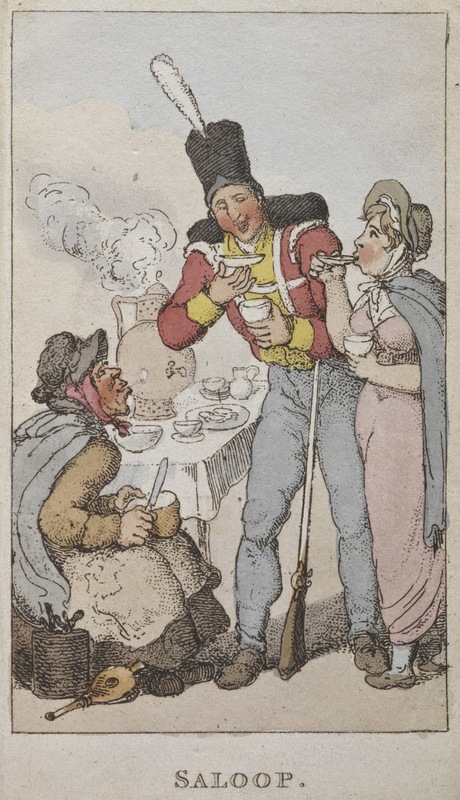 Caption: 'Saloop', a popular beverage of the 18th century. Salop was served in coffee houses as an alternative to coffee or chocolate; and salop-vendors peddled the drink in the streets, or sold it from booths. In this picture a soldier is enjoying a cup. By Thomas Rowlandson, 1820.